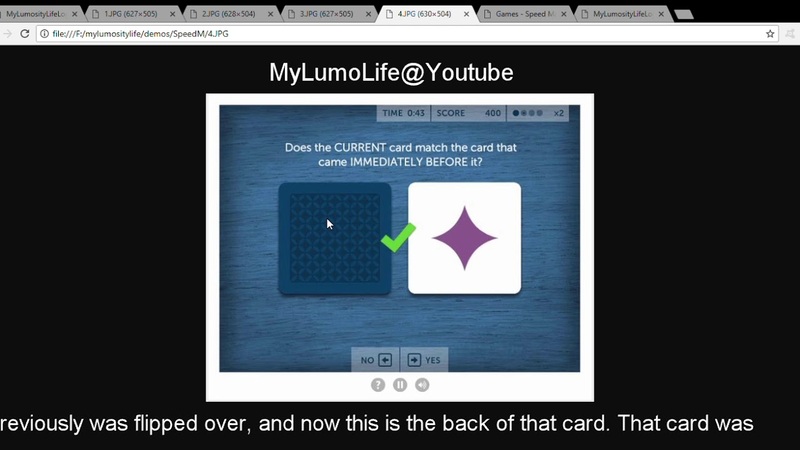 A tutorial video of how to play Lumosity Speed Match. This game is one of Lumosity's speed games. PRESS PLAY TO WATCH THE VIDEO. A tutorial video of how to play Speed Match, a Lumosity speed game. "Hi everybody. Today, I am going to show you how to play Speed Match. When you start this game, this is the screen that you’re going to see. The 3 signifies a 3 second countdown. This is the first card that you have to memorize or remember. You don’t need to remember the shape, you just need to remember the color. In the next screen, the card that you previously saw, was flipped over, and now this is the back of that card. The question is, does the card match the card that came immediately before it? This is the current card. The card that came immediately before it was red and this is aqua. Therefore this card does not match the previous card. Therefore the answer is no and you press the left arrow key on your keyboard to answer no. In the next screen, the previous card that was on this side has been flipped over and this is the back of that card. So that card was aqua in color and this cad is purple in color. Therefore this card does not match the previous card and therefore the answer is no, and you press the left arrow key on your keyboard to answer no. In the next screen, the card that was on this side previously was flipped over, and now this is the back of that card. That card was purple in color and this card is also purple in color. Therefore this card matches this card. So you press the right arrow key on your keyboard to answer yes. That is how to play Lumosity Speed Match." widgetinstance 511 (Related Topics) skipped due to lack of content & hide_module_if_empty option.